The portrait in its gilt frame depicts a portly gentleman, possibly French and — to judge by his dark frockcoat and plain white collar — a man of the church. The work appears unfinished: the facial features are somewhat indistinct and there are blank areas of canvas. Oddly, the whole composition is displaced slightly to the north-west. 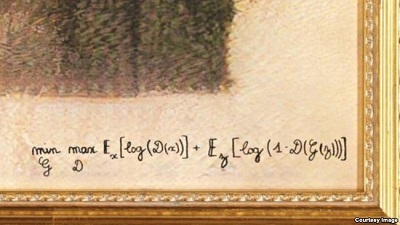 A label on the wall states that the sitter is a man named Edmond Belamy, but the giveaway clue as to the origins of the work is the artist’s signature at the bottom right, an algorithm. This portrait is not the product of a human mind. It was created by an artificial intelligence, an algorithm defined by that algebraic formula with its many parentheses. And when it went under the hammer in the Prints & Multiples sale at Christie’s on 23-25 October, Portrait of Edmond Belamy sold for an incredible $432,500, signalling the arrival of AI art on the world auction stage. But one of the beguiling things about the depiction of Edmond Belamy is that it departs from a human idea of an 18th-century portrait. There is something weirdly contemporary about him: he looks unnervingly like one of Glenn Brown’s art-historical appropriations. Why might that be? Elsewhere in the AI world, researchers are playing other art-historical games. Ahmed Elgammal, director of the Art and Artificial Intelligence Lab at Rutgers University in New Jersey, is working with a system that he calls CAN — a ‘creative’ rather a ‘generative’ network. The basic binary hokey-cokey is the same — maker and judge, artist and critic — but CAN is specifically programmed to produce novelty, something different from what it sees in the data set, which in this case consists of all manner of paintings from the 14th century on. Read the source article at Christie’s.